Work started quickly and after only four months the Hall was finished. An article in the Herts and Essex Observer at the time described it as “a handsome building of brick and red slates”. 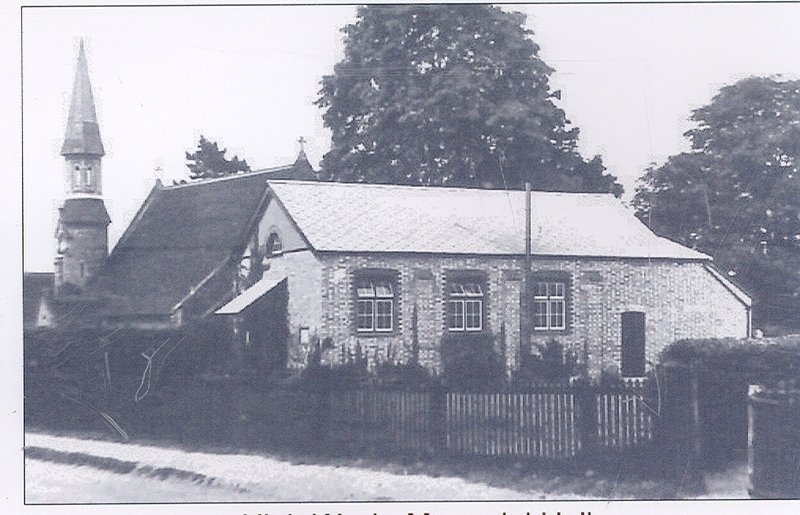 In time High Wych Memorial Hall became a focal point of local village life. It was a meeting place for High Wych Village Club, The Women’s Institute, the Men’s Club, The Scouts and Cubs, The Girl Guides and the Brownies. The Hall was also used as a canteen forthe children of High Wych School. Until the early seventies schooldinners were prepared in the kitchen and served in the Hall itself. Those who were there remember hard folding chairs and splinters in backsides! During the Second World War, High Wych Memorial Hall provided services for the women working in the Land Army. Dinners were often prepared and served for them there. Whist drives were organized as well as dances when locals and visiting members of the armed services jitterbugged to the music of J.R. Dimmock and his 5 piece band from Hoddesdon. The post war years are mainly remembered for two people : Arthur Clow and Michael Elsdon. Arthur Clow who served from 1939 until 1969, was caretaker, treasurer, booking secretary and secretary rolled into one. Those who wanted to hire the hall went to see him, paid the money, got the keys and got on with it. Mike Elsdon, a young mechanical engineer who worked at Holbrooks came to High Wych in 1940. Immediately he became involved in local affairs including the Village Hall. In 69 Len Helmer proposed Mike Elsdon become chairman and the Hall Committee was put on a more formal footing. Most importantly preparations were started for an extension of the Hall. Mr Bob Springham, a young local architect, offered his services and produced the necessary drawings and a model. All that was needed now was the money!!! Over the next months and years Mike Elsdon lead his committee in a frenzy of fundraising and discussions on planning and finance. Our one hundred club was also started around that time. In the end total costs of the project came close to £ 20.000, a big sum for those days. Luckily some financial assistance was provided by the local council. By the summer of 1973 a formal dedication ceremony was held. In 1972 Jack Balaam joined the Hall Committee. Whilst he was not in the same vein as Arthur Clow,he did for many years serve as the first point of call for those wanting to hire the Hall. Jack, who served as both treasurer and booking secretary was on the committee for many years until his untimely death in 1991. Many still remember him withadmiration and affection. Mike Elsdon stayed on as chairman until 1976 when he was succeeded by L.J. Hibbs who was followed by Charles Wentworth Stanley who served until the early nineties. Through all those years, in fact until 1995, Mike Elsdon stayed on the committee giving us the benefit of his experience. Through all those years the Hall has continued to play an important role in High Wych village life.